It's Monday morning, and we all know what that means! More joy and goodness delivered straight to your Nintendo Wii entertainment system, courtesy of the young sprightly elves who handle WiiWare and their older, more jaded Virtual Console counterparts. Despite the Virtual Console's strong showing this week with Mega Man 3 for the NES (500 points), the game that introduced us to Proto Man, Rush, and the electric slide, WiiWare comes out on top this Monday for the simple fact that it has a game that allows you to serve pizza to ninjas. Yummy Yummy Cooking Jam from Virtual Toys (1,000 points) is a fast-action cooking game that has you working your way through four different restaurants on your way to becoming the best chef in the city, serving the needs of local ninja, alien, mafia, and vampire population. If you don't find that exciting, you might want to spend some time on this week's other WiiWare title, Gameloft's Brain Challenge (1,000 points), though probably not.WII-KLY UPDATE: TWO WIIWARE GAMES AND ONE VIRTUAL CONSOLE GAME ADDED TO WII SHOP CHANNEL Nov. 10, 2008 Are you hungry? Think of this week's Wii™ Shop Channel lineup as a lively menu that aims to satisfy every appetite. You'll find a food-themed game to tempt your tummy, a challenging brain game to please your noggin and a classic sci-fi action title to fuel your imagination. Whatever the recipe, you're sure to come back for seconds-and thirds, and fourths, and beyond. Nintendo adds new and classic games to the Wii Shop Channel at 9 a.m. Pacific time every Monday. Wii owners with a high-speed Internet connection can redeem Wii Points™ to download the games. Wii Points can be purchased in the Wii Shop Channel or at retail outlets. This week's new games are: WiiWare™ Brain Challenge™ (Gameloft, 1-4 players, Rated E for Everyone, 1,000 Wii Points): Just like your body, your brain needs to be exercised to stay in shape. Boost your brain and relieve stress through various minigames in a personal session to get a detailed evaluation. Challenge your friends' brains in delirious party games to see who is the smartest. Test your brain's abilities in Visual, Memory, Logic, Math and Focus minigames. Compare yourself with friends by challenging their brains in three multiplayer modes. Develop your resistance to stressful situations that could happen in real life. Use a customized Mii™ character to create personal sessions. Choose your favorite personal coach. Track your overall performance with detailed statistics and graphs. The special Kid Test and Senior Test modes will gather everyone around the game. Yummy Yummy Cooking Jam (Virtual Toys, 1-2 players, Rated E for Everyone-Animated Blood, Comic Mischief, 1,000 Wii Points): Yummy Yummy Cooking Jam is a frenetically active cooking game in which you must serve food to your customers as quickly as possible. This could be a simple task, but the customers aren't very patient, and you'll find a multitude of annoying insects that make the noble mission of satisfying your small gourmets' stomachs much more difficult. In the game's Career Mode, your goal is to become the best chef in the city. To do so, you have to prove your worth by cooking in four fantastic restaurants: the Hot Dog, Hamburger, Pizza and Mexican Restaurant. Enjoy playing Yummy Yummy with your family, serving delicious food to the most surprising characters: vampires, ninjas, extraterrestrials and mafia thugs. Put on your chef's hat, sharpen your knives and turn up the heat. Virtual Console™ Mega Man™ 3 (NES™, 1 player, Rated E for Everyone-Mild Cartoon Violence, 500 Wii Points): In the year 200X, the notorious Dr. Wily, now reformed and working for the forces of good, works hand-in-hand with Dr. Light to build a new type of peacekeeping robot. When a new set of eight Robot Masters escapes the lab to wreak havoc on the world at large, only Mega Man can save the day. 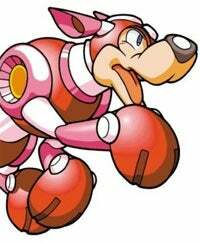 This time, Mega Man must rely on his new slide move and canine companion Rush to conquer the stages and vanquish evil. A new character, Proto Man, adds to the mystery and appeal of this seminal title in the famous action-game series. For more information about Wii, please visit wii.com.